An old joke says that you should not be afraid of flying, but rather of not flying. In August 1896, the German engineer Otto Lilienthal tragically captured the reality of this phrase when he lost his life 36 hours after his glider plummeted to earth. He was not the only aviation pioneer who would die as a result of not being able to master the control of his flying device. Lilienthal’s death was especially significant for two Dayton brothers (Ohio, USA) dedicated to the repair and sale of bicycles, and who had followed the progress of the German with great interest. The news of the fatal accident was the definitive trigger for Wilbur (April 16, 1867 – May 30, 1912) and Orville Wright (August 19, 1871 – January 30, 1948) to apply their knowledge of bicycle mechanics to a hobby that they had been working on for years. Wilbur, the eldest of the two, was the one who dragged his brother into what they called “the problem of flight,” which they viewed as a challenge on three different fronts. The first of them, rising from the ground in a heavier than air apparatus, was essentially solved from ancient times. The example of Leonardo da Vinci is well known, but not so much that of earlier precursors as the Andalusian Berber Abbas Ibn Firnas in the ninth century or the English monk Eilmer of Malmesbury in the eleventh century. When the Wright brothers were ready to build their first glider, they copied the design of the biplane previously created by their contemporaries like Octave Chanute and Augustus Herring. The second challenge, propulsion, had also been explored by some of their peers such as their compatriot Samuel Langley, the American-born British inventor Hiram Maxim or the French inventor and engineer Clément Ader, who focused their work on equipping their devices with powerful engines. But the Wright brothers’ view was that there would be time later to think about the best way to propel airplanes; at first they preferred to settle for gliding, but to do so they had to tackle the third and greatest of the challenges, which until then none of the other budding aviators had completely solved: controlling the flight. 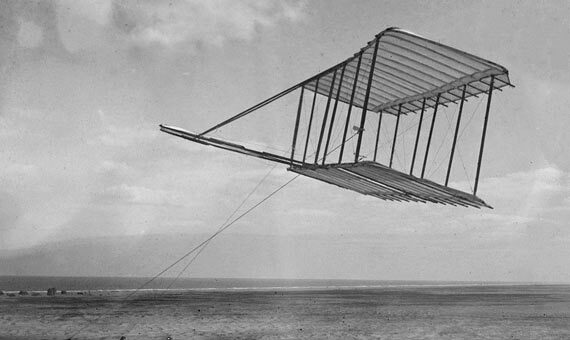 The Wright brothers did not want to build just an airplane, but rather one that could also be piloted. From the beginning, they rejected the option of Lilienthal, which consisting of tilting the body to turn. Nor were they convinced by the idea of ​the​other pioneers who applied a positive angle to their wings with respect to the horizontal (positive dihedral) to confer an intrinsic stability to the device. The brothers thought that the pilot had to have full control over the flight, and they believed that there had to be a better way to do it. Wilbur discovered the solution by observing the flight of birds, which vary the angle of the ends of their wings to tilt around the longitudinal axis and thus attack the turn. In aviation this movement is known as roll. To apply it to their models, they invented a control that deformed the ends of the wings. In modern aircraft, this effect is achieved thanks to the ailerons. The Wrights also studied how to control the pitch, the spin around the axis that follows the line of the wings. To avoid stalls like the one that cost Lilienthal his life, they opted for a forward elevator that lifted the nose. Today this movement is controlled with rudders in the tail of the airplane. 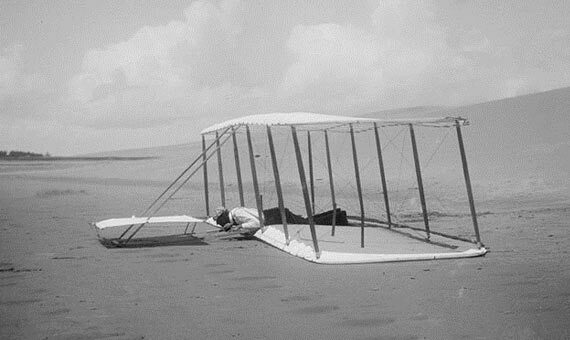 Between 1900 and 1902, Wilbur and Orville tested their gliders in the coastal town of Kitty Hawk, North Carolina, and their models in the wind tunnel they had built in their workshop in Dayton. During these tests, they found that wing flexing had an undesirable effect: in the warping movement, the end of the upper wing is more resistant to air, causing the nose to point in the opposite direction of rotation. This movement around a vertical axis is known as yaw. The Wright’s discovery was to understand that the steering rudder (in the vertical plane of the tail), which had been dispensed with in their earlier designs, did not function to turn the craft as occurs in ships, but to align the nose with the turn during the roll. 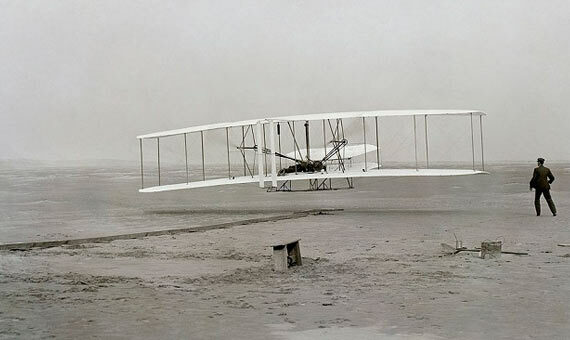 The handling of the airplane was the subject of the first patent of the Wright brothers, presented in March 1903. On December 17 of that same year, they achieved their best-known feat, to take off in their first propeller-propelled device, the Wright Flyer I. But by that time, Wilbur and Orville Wright had already made their essential contribution, the one by which they can be considered the legitimate inventors of the airplane: the control of movement in the three spatial axes, a concept that continues in force more than a century later.